A new paper in the Journal of Geophysical Research shows that sea level rise in the northern Indian Ocean rose twice as fast as the global average since 2003. This represents a stark contrast to the previous decade when the region experienced very little sea level rise at all. 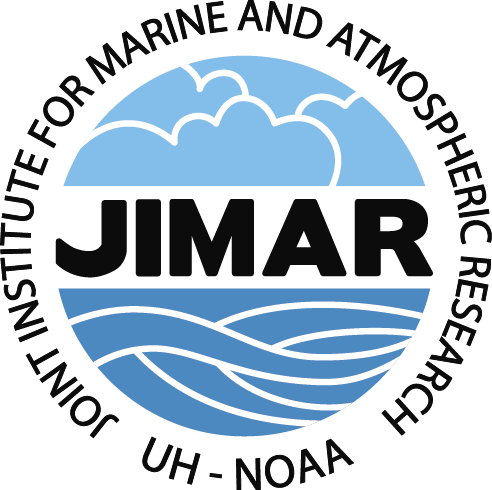 The science team led by Philip Thompson, associate director of the University of Hawaiʻi Sea Level Center in the School of Ocean and Earth Science and Technology (SOEST), analyzed two and a half decades of ocean surface height measurements taken from satellites. The satellite data showed a substantial and abrupt increase in decade-long sea level trends in the Indian Ocean region, which prompted the oceanographers to investigate the cause of the shift using computer simulations of ocean circulation. When trade winds in the Indian Ocean are weaker north of the equator compared to the south, warmer water at the ocean surface is driven out of the Northern Hemisphere, and colder, deep water is moved in. This has a net cooling effect on the ocean, leading to the suppression of sea level rise. This is what occurred early in the satellite record, but recently the situation reversed, causing heat to build up in the northern Indian Ocean and enhancing the rate of sea level rise. Many of the world’s most vulnerable populations to sea level rise can be found in these parts of the Indian Ocean, including those in Bangladesh and Jakarta. “What we are learning is that the interaction between the ocean and atmosphere causes sea level to rise like a staircase instead of a straight line—starting and stopping for many years at a time. What we’ve done here is described one stair, which will help us better understand and plan for the future,” said Thompson. The science team will continue their work using similar techniques to understand sea level variability in the South Indian Ocean, investigating how heat is exchanged between the Indian and Pacific Oceans. 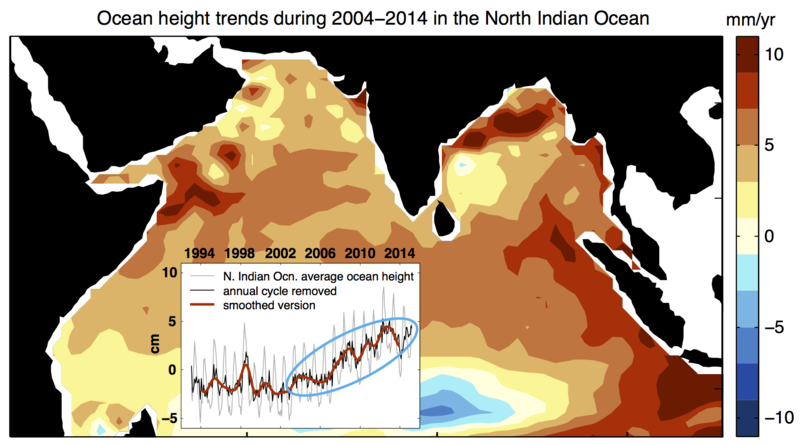 Figure: The colors in this image show trends in ocean height over the equatorial and northern Indian Ocean during 2004-2014. Darker reds indicate a faster rate of rise. The red line in the inset shows the average ocean height in this region since 1994 when satellites began measuring the height of the ocean surface.